Well, what a gorgeous summer we are having; this never-ending wall of sunshine has meant I have boldly put a bag of jumpers in the loft and exposed my rarely seen knees to some Yorkshire sunshine! As a result, we have noticed that shorter haircuts have become a popular request and what fabulous ones have been created by our talented team. If you would like to take the plunge and go shorter or have highlights added to your sun- kissed hair, please pop in to make an appointment or visit www.zeitgeist.com or call 01422 844974 and we will be happy to help. As well as this gorgeous weather making Hebden Bridge rather a splendid place to be, we have also experienced the Hebden Bridge Arts Festival. As part of the Festival, I was lucky enough to have a ticket to see Bridget Christie and saw a lot of you there. Have a look on Netflix if you want to catch her, she really is worth a watch. The theme of the Hebden Bridge Arts Festival was non-conformism and in keeping with this we made some changes to our window display. 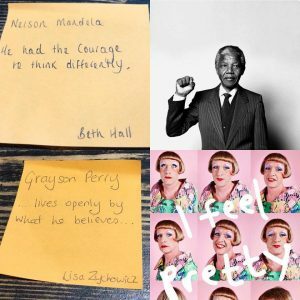 Pennine signs produced our ‘THINK DIFFERENT’ logo and our amazing clients came up with the names of some inspirational non-conformists to decorate the window and what an incredible selection we had; Nelson Mandela, Tracey Emin, Mary Beard, Jo Cox and Grayson Perry to name but a few. In Salon news, Amy is very much back into her stride working alternate Fridays and Saturdays, so if you want to secure an appointment with her, it is worthwhile booking well in advance as she is a very popular lady (and rightly so!). Becky is having a much deserved extended holiday during the summer, her last day in the Salon is Wednesday the 18th July and she will be back in on Saturday 18th August. Though it seems a bit peculiar to say it, as I write this in my garden in my t-shirt and skirt (knees exposed), we are now taking bookings for Christmas and we have quite a few appointments for December already! 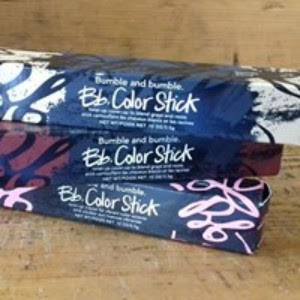 In Product News, I have been investigating the benefits of bumble and bumble’s color stick, which is ideal for anyone having a long break over the summer unable to get their hair coloured as regularly as they would have liked. We have colour sticks in natural colours, ideal for those grey hairs you want to cover up, or we have some lilac colour sticks which give a flash of temporary colour. They are extremely easy to use, stroke them on like a lipstick, pinpointing where you would like the colour, blend in with your fingers and wash out on your next shampoo. I am also going to try a lemon and lime cake, in honour of our lovely client Barbara who has been very complementary about my lemon drizzle! Well, enjoy the summer everyone……..think of me, six weeks with four boys to entertain………gin anyone?